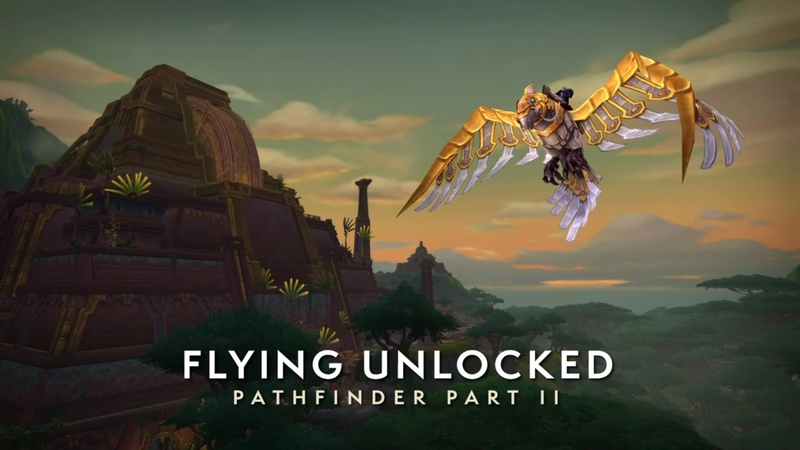 With Rise of Azshara, of course, comes the second half of the Pathfinder achievement and unlocking of Flying. Once you have unlocked Pathfinder Part II, you will be immediately granted this gorgeous mechanical parrot mount. We think that unlocking Flying in these areas is going to feel awesome. Once you have flown around the Naga caverns– I don’t know if you are going to want to fly in other zone. It is a lot of fun navigating it. 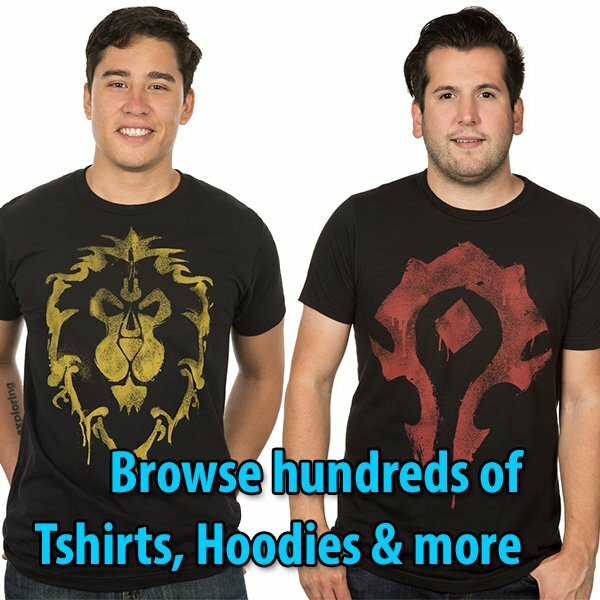 So let’s talk a little bit about Mount Equipment slots. We have an ever-present problem, which is that there is one mount that is incredibly powerful. Especially, if you are leveling, and especially if we are about to head down into a zone that has puddles, and streams, and stuff… and that’s the Waterstrider. The Waterstrider has innate water walking, which makes it very useful for anybody. But not all of us want to roll around all the time on a bug mount. 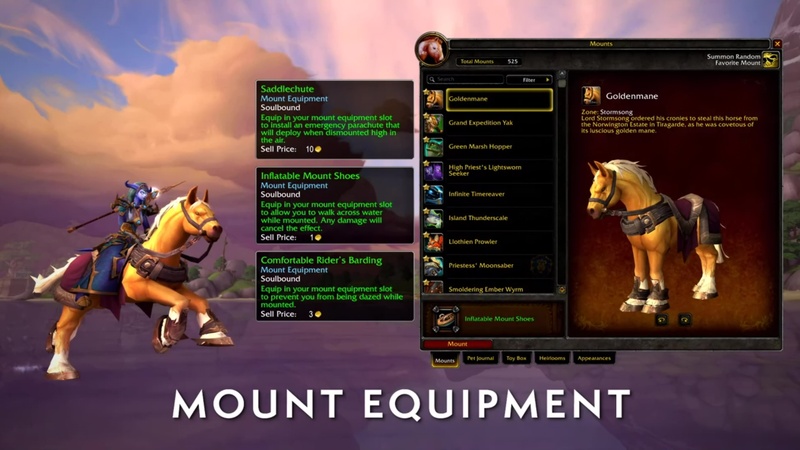 So we will be introducing a brand-new item and equipment slot called Mount Equipment. This equipment slot is on your character, and once you have applied a piece of Mount Equipment to it, all of your mounts will receive this benefit. Some of the pieces of Mount Equipment that you are going to apply to your character in Rise of Azshara include a Saddlechute that gives you an automated parachute when you jump too high of a height– if you like exploring, you may like that. You can also get Inflatable Mount Shoes that grant water walking to all of your mounts, so you no longer have to use your Waterstrider necessarily, unless you really enjoy it; and the Comfortable Rider’s Barding which can prevent all of your mounts from being dazed. We found that the Mount Equipment slot is an awesome new way to allow you to pick whatever mount you want, in whatever context; and we will have more information to share once we have hit the PTR.